The end of the road brought us to the Cockle Creek camping ground at the Southwest National Park. 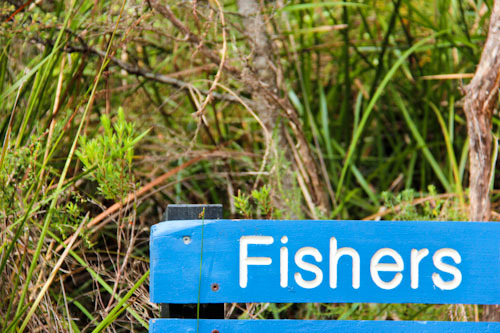 Camping is free, the wildlife is tame, and the bush is pristine. The weather has been changeable, so for the last couple of days we’ve alternated playing in the bus with games outside and on the beach. 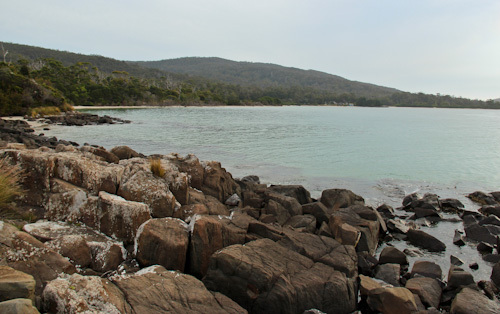 Recherche Bay's remote location means it remains largely undeveloped. At the very, very end of the road, there's a walking track that calls us by name. 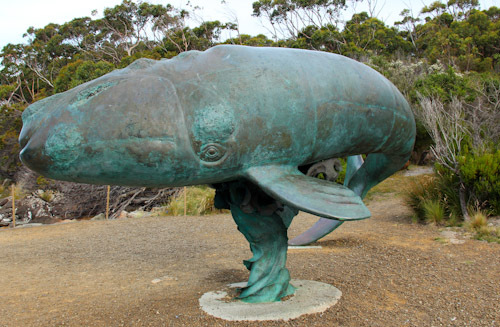 A bronze sculpture of a three-month-old Southern Right whale commemorates these magnificent ocean creatures who pass this point in their annual migration as well as those who were mercilessly killed by our ancestors. 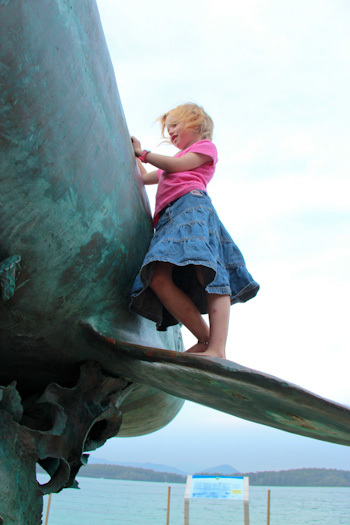 When Brioni knocks on the sculpture, she's surprised to discover from its tone that it's made of metal. We park our bus just off the road and on grass so short it looks like artificial turf. The local wildlife keep it trimmed to carpet height. 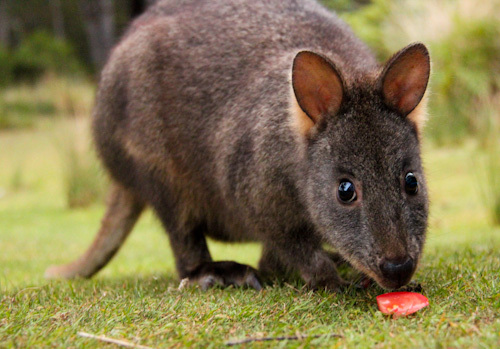 This almost-tame pademelon gladly cleans up the scraps that have fallen from our sandwiches. 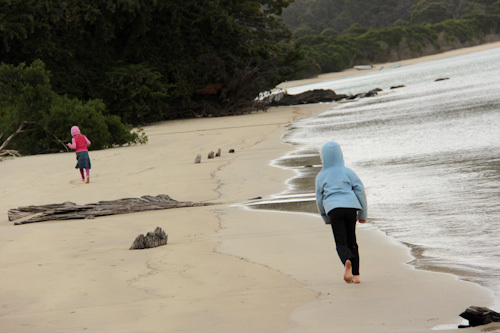 When the weather is fine, we eat outside and go to the beach to play on the sand and explore the landscape. 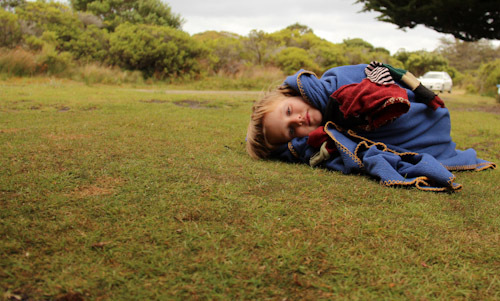 I realise the rest of Australia is sweltering in midsummer heat, but we're feeling chilly this far south. When the sun comes out from behind the clouds, you'll find us at the beach. We go for walks along the smooth sand, never knowing what we'll find. We love exploring beaches with rocky sections. 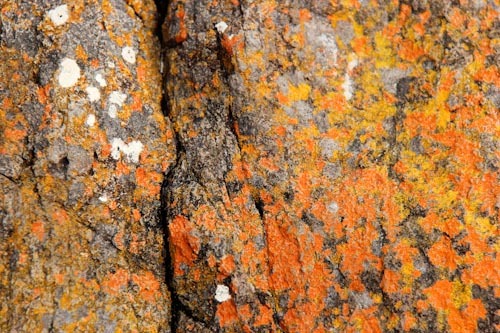 The rocks always contain many creatures to discover. It's easy to walk over the rocks without really looking at them, but a closer examination shows a range of algae in interesting colours. 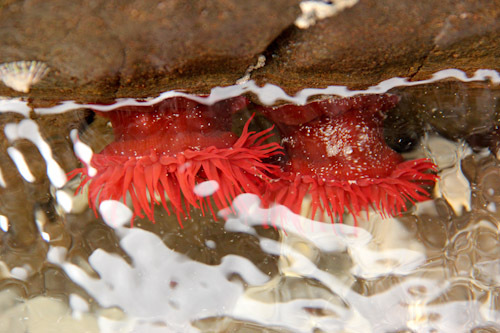 Ruby jewels hang on tightly to the rocks, releasing their tentacles when the water covers them. 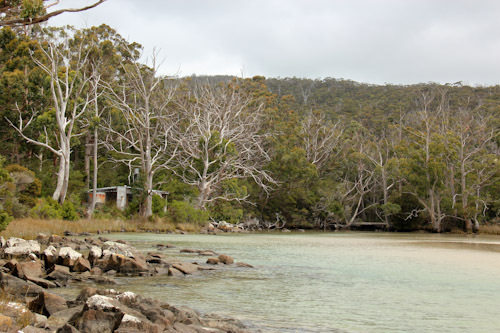 A shack is nestled into the bush. There are a few private residences this far south, but we don't investigate to see if this one is occupied. 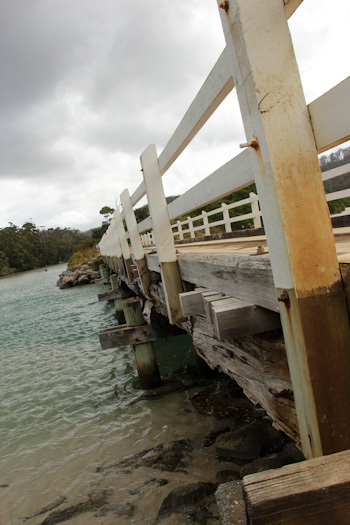 The bridge over Cockle Creek provides enough height for jumpers. On our first day here, teenaged boys were doing back-flips off the railing and into the water. If the water was a bit warmer, I may have considered a bridge jump. Two shells make funny ears! At certain times the tide is in and we can't avoid getting wet. 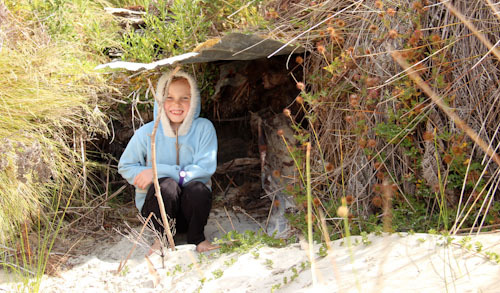 Aisha uses found materials to fashion a fort on the edge of the sand. 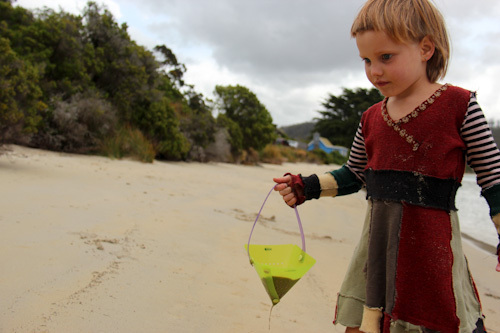 Calista collects water for her sandcastle further up the beach. 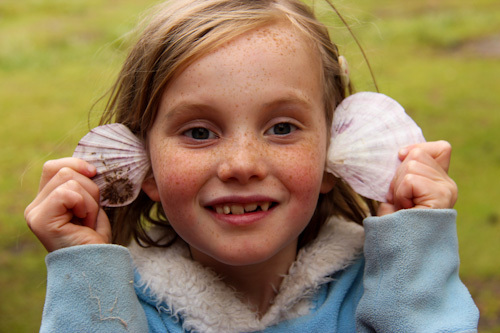 Brioni is always on the search for creatures and finds some mussels that she wants to turn into pets. Carefully, one-by-one, Dell breaks sticks off a nearby shrub and pokes them into the sand. "They're people," she replies, when I ask her if she's making a fence. 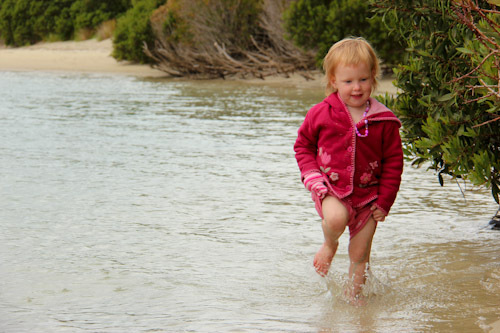 In a spontaneous gesture of bravado, Delaney throws off her clothes and walks into the waves. It isn't long before she returns to me and requests me to make her warm again. 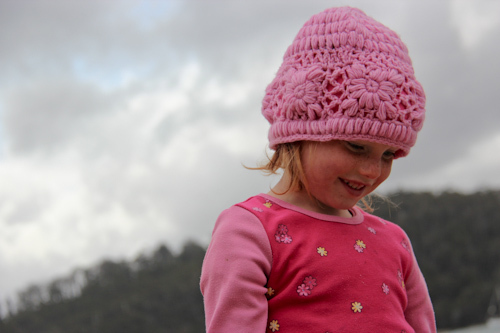 I love alternating our urban adventures with ones in the bush. 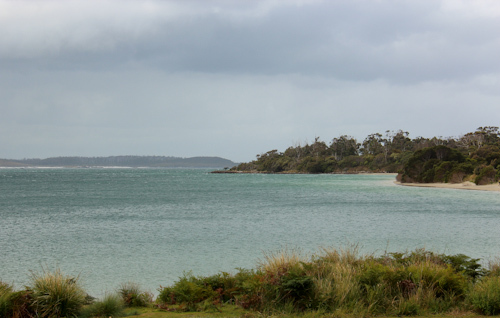 Cockle Creek has been a restful place to camp. There are toilets and taps here, and we’ve been joined by other travellers every day. 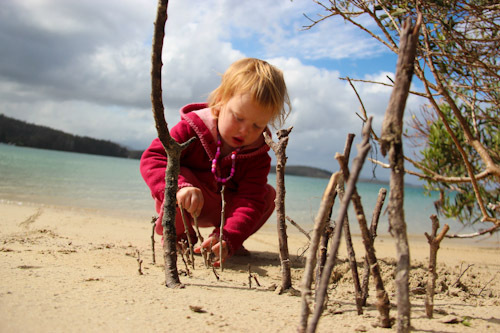 Some families are camping here long-term, and others spend just one night. I like the break from all our driving, but now it’s time to hit the road again. We last shopped for fruit and vegies on Sunday, and although we aren’t completely out of fresh food, we’re running low. This means we need to head back through towns and past roadside stalls that sell produce. Otherwise we could contentedly camp here for another week or so! And yes it seems crazy to see people rugged up when up here (Beenleigh) it was disgusting and sweltering today! What an amazing childhood your children are having! I wish I could spend a week with you guys and maybe learn how to go with the flow and just experience life like you do (if that makes any sense). I love that Delaney said her sticks were people! That’s so gorgeous. Also love the new banner. i love the your pictures with all the lush green foliage. 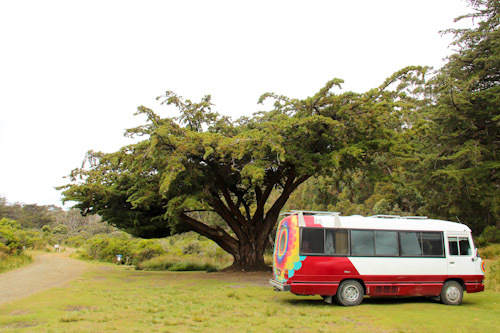 especially that great tree next to your bus. wow. what a great place. i’m especially envious since we have freezing rain right now, a blizzard warning for tomorrow and then the temperature is going to drop to around -30 centigrade next week. enjoy your beautiul green stuff. i’m off to make a cuppa and watch the white stuff begin to drift down. This is a beautiful spot. The girls seem to grow so fast and seem so joyful and happy. You have a lovely family Lauren. Ha! I’m a first time visitor to your blog… a blogger friend of mine asked me this morning if I’d seen your bus while I was in Cockle Creek last week. 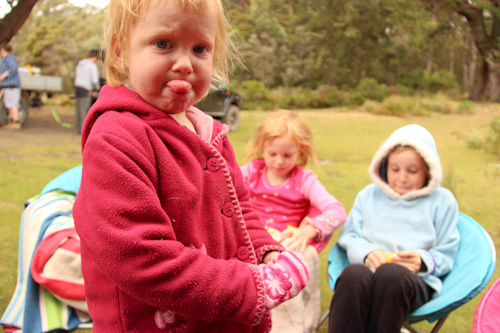 She showed me a picture – turns out that we camped next to each other! We were in the tiger-striped campervan, little blonde boy and a teenaged girl. 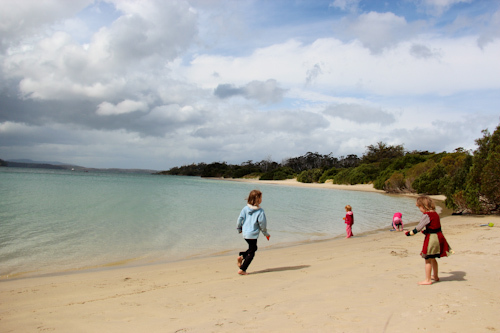 Such a beautiful place, but the hail, rain and wind made it hard to get out with the kids!